Kingbirds, Orioles, and Redstarts, Oh My! It’s still amazing to me what a couple days of Northwest winds can do for birding in Cape May. Those of us who dragged ourselves out of bed and hiked up the Higbee dike before dawn were rewarded with the first big push of migrant songbirds. Birds are everywhere. Even now as I sit here at the Northwood Center writing this post, I can glance out the window and see a handful of warblers, vireos, and flycatchers working their way through the treetops. But like all migrations, there is a seasonality to our diversity and a few species have invaded us with impressive force. It seems pretty much anywhere you look, whether it is the elevated view from atop the dike or walking the fields around Higbee, Eastern Kingbirds are abundant. Their chasing and diving after one another is nicely contrasted with a tendency to pose in the tops of trees. It’s quite the spectacle to behold when they all lift up at once, swirling and swarming in groups of a hundred or more. Our Morning Flight count for Eastern Kingbirds hit a high of 664 individuals on Thursday. With that many birds around, their presence is always apparent. Another common sight this week, much to the pleasure of our photographer friends, are Baltimore Orioles. These vibrant, freshly molted migrants can be seen throughout Cape May right now and their sweet, whistled calls have been the soundtrack of Higbee mornings. There is nothing quite like watching a male Oriole flying past the dike at eye-level, with the rich blue water of the Delaware Bay as a backdrop, to remind yourself why you love birding so much. My personal favorite about town right now has to be our American Redstarts. Their striking plumage, seemingly incessant movement, and frequent tail fanning gives them a tenacity that you can’t help but love. Couple that with a foraging technique that looks like they suddenly took a tumble out of the tree and you have a warbler that never fails to entertain! With nearly 600 counted during Thursday’s Morning Flight, you would be hard pressed to go birding around Cape May and not see a few. A couple other species worth noting (that didn’t fit into my catchy title) include Red-eyed Vireos and Black-and-white Warblers. For a relatively small bird, Red-eyed Vireos make a significant amount of commotion as they jump, hover, and sometimes crash through the trees looking for insects and berries. Our eyes can’t help but be drawn to all that movement, so I have found myself studying a disproportionate number Red-eyed Vireos this week. The trees are also crawling with Black-and-white Warblers, literally. This bird was once described to me as a “Zebra creeper” and I think it’s one of the better nicknames I have heard. It’s fascinating to watch them work their way along a branch or trunk as they check every nook and cranny for morsels of food. They are remarkably efficient and I doubt much gets left behind. As August draws to a close, the weather has cooled and the birds are bountiful. Yes, Northwest winds do wonderful things for us in Cape May. Make sure your camera batteries are charged, your binoculars are clean, and keep an eye on the winds. Early mornings are much more enjoyable when you spend them outside, so get up and go birding! Fall is here and it’s downright delightful! 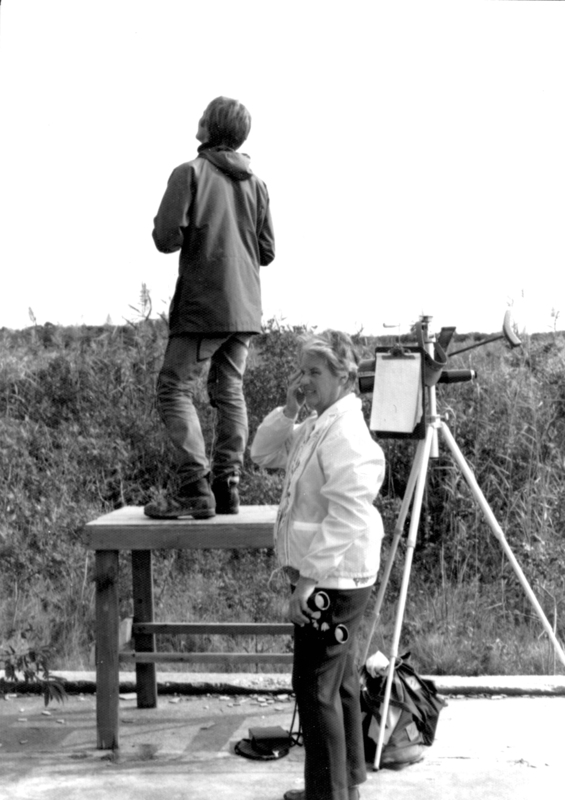 New Jersey Audubon’s Cape May Bird Observatory (CMBO) was born on the premise that someone needed to be monitoring the massive spectacle of migration happening in and around Cape May each year. More precisely, it was the hawk movement as witnessed by those who were banding hawks here at the time that inspired the initiative to establish a bird observatory on the southern tip of New Jersey. Bill Clark was the bander, and New Jersey Audubon was the organization that would provide the nonprofit status to make it happen. That year was 1976, and the first official counter of the Cape May Hawkwatch was my predecessor, Pete Dunne. Pete Dunne atop the "platform" in 1976. Rosalind Holt stands by as one of the first official visitors. It’s safe to say that migration monitoring is hardcoded into the DNA of this organization. Since then, the Monarch Monitoring Project (26 years old), the Avalon Seawatch (23 years old) and the Morning Flight Songbird Count (13 years old) have all been established to do the same thing: keep our finger on the pulse of migration through Cape May so that the long-term record may support necessary conservation efforts, and provide compelling information to engage the public, for true conservation is impossible without public support. All of this, of course, fits squarely within the mission of New Jersey Audubon: Connecting people to nature and stewarding the nature of today for the people of tomorrow. 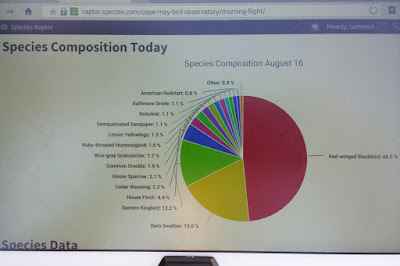 One year ago the VP of Research for New Jersey Audubon, David Mizrahi, and myself, set out to bring these datasets into the modern era of “big data”. That meant rethinking the way we store and interact with the migration information to come up with a solution that would allow for wide collaboration with research partners, and the ability for public exploration and interaction with the data. It’s really quite simple in theory: create a cross-platform database system that is standardized across projects and provide an interface for both data entry as well as public interaction. Since we began this effort we have developed a database schema and, with the help of some wonderful volunteers, have begun normalizing the data to bring it into the database. We plan to have some of this historic data available to the public via our website this fall, although full implementation will take another year. This brings me to our big announcement: Last fall I was visited by a young entrepreneur and birder, Russell Conard. Russell founded a company called Ornicept, which makes a product called Specteo designed specifically to collect observational data in the field. To make a long story short, last spring we tested Specteo for collecting large amounts of waterbird data, and our experience proved to us that it was both stable and efficient at collecting the data we need, reduced the chance of data errors associated with transferring from paper to digital, and has the capability of transmitting this data in real-time time to servers in the cloud. As part of the Specteo Ambassador program, Specteo engineers have constructed several web portals for CMBO to display the data we are collecting this year. On these sites you will be able to view count data as it comes in, as well as explore data from the 2015 field season. During the season I will continue to reach out to you and let you know about the historical data on our website. In the meantime, enjoy the first ever live-streaming of migration data from our Morning Flight Songbird Count (live NOW! ), Cape May Hawkwatch (begins Sept. 1) and Avalon Seawatch (begins Sept. 22). Thanks to Carol, Russell and K.C. at Specteo for helping us bring our data to the forefront of modern technology. 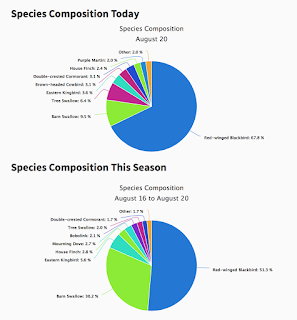 Example of the daily and seasonal data on species composition produced by Specteo. 2015 Morning Flight Songbird Count. If you are interested in supporting CMBO’s continuing efforts to collect, analyze, and disseminate these data, please consider both becoming a member of CMBO, and making a tax-deductible donation. You may do both on our new FeatherEdgeOptics.org website, and following the Member or Donate items in the top menu. Though the beach-going tourists flocking to Cape May right now might think that it's high summer, the birdwatching calendar has most decidedly turned the corner into fall, and mid-August marks two classic fall events for Cape May birders - the Maurice River Purple Martin spectacle and the start of CMBO's Morning Flight count at Higbee Dike. Ashamed as I am to admit it, I had not previously witnessed the post-breeding gathering of Purple Martins on the Maurice River before this weekend, so volunteering with my wife to help on the river cruise, organized by Citizens United to Protect the Maurice River aboard the Bodacious seemed the ideal thing to do. Purple Martins are nothing if not sociable, and gathering in large flocks is typical behavior for them outside of the breeding season. As with many species of birds that employ communal roosting behavior, Purple Martin roosts tend to occur at traditional locations and large numbers can build up over a period of years. Provided the sites are left unaltered and are considered safe by the birds, such traditional roosts may be used for very many years and older sites can attract very high numbers of birds. The roost on the Maurice River has, in recent years, moved around a little, but has generally been centered on dense stands of Common Reed a little north of the Rt 670 bridge at Mauricetown. Though the roost is visible most years (though sometimes distant) from the bridge itself, little can compare with the experience of being out on a boat on the river while tens of thousands of birds swirl around, chortling overhead. The roost is generally in evidence at this location throughout most of August, so if you have not yet made the pilgrimage, then I suggest you contact Citizens United and see if you can get yourself on a boat trip. Be warned though, these trips are very popular and there may well already be a waiting list. Purple Martins swarm above the heads of their admirers on the Maurice River last night [photos by Mike Crewe]. As if the dynamism and excitement of rushing hordes of pre-roost Purple Martins was not enough of a buzz, the trip up river also allows for some excellent Bald Eagle watching - we saw at least six different birds - as well as the ubiquitous Ospreys and assorted migratory waterbirds. Swirling against a pink-stained sky as the sun sets low to the west, the Purple Martins produce a wonderful sight, but the gatherings mark the end of another breeding season for them and the roost will gradually fall in number as parties of birds head south to winter mostly in Brazil, where they will remain highly gregarious throughout the northern winter. Much has been learned about Purple Martin through the efforts of a variety of scientific research programs and the collective data of the Purple Martin Conservation Association and its affiliates, but we still don't know all that much about the make-up of these post-breeding roosts; how long does an individual bird remain in the roost before heading south? Are individual birds site-faithful to a single roost or do they move around from night to night - or year to year? There's still so much to learn about these intriguing birds. 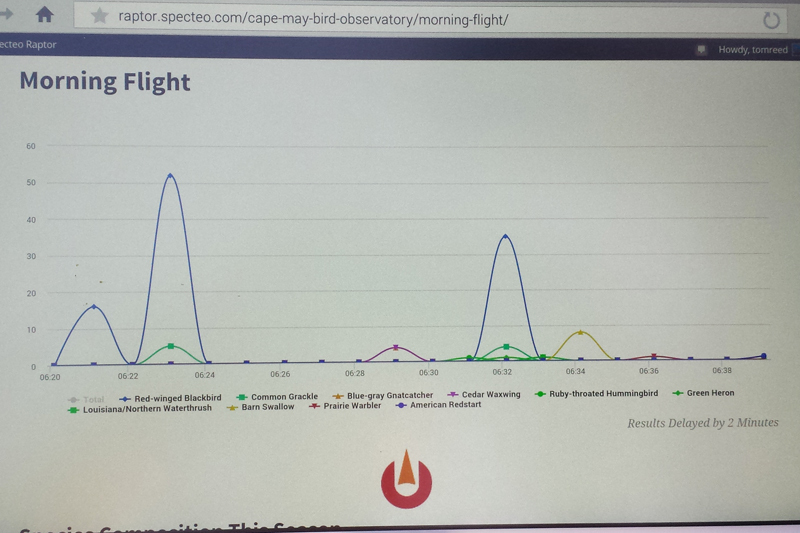 And so to the second of our mid-August landmarks - the Morning Flight count. This year's count kicked off a little quietly, it is fair to say, and I am sure many birders looked at the weather forecast the night before and thought "You know what? I think I'm going to have a lie in". For migration is nothing if not weather dependent and this morning's weather was clearly not going to be dropping scores of drift migrants onto Cape May. However, scientific data needs to follow strict protocols, and the start date is predetermined by previous year's protocols. So it was that a small but faithful band - including Glen Davis, the 2015 Morning Flight official counter, and Tom Reed, swing counter and count co-ordinator, among others, climbed the slippery slope onto the dike and at precisely 5:59AM, we all looked aloft and counted... well, not much at first. But this is science, and if there's nothing to count, that needs to be recorded too. Eventually, something of a trickle came our way and the 2015 count was well and truly started. But things were not the same this year; for a brief period (until it broke!) a chair made an unprecedented appearance on the dike, but far more importantly, a tablet, containing a spanking new computer program made its inaugural appearance. Yes, 2015 sees the introduction of a new way of logging and storing data for the CMBO seasonal counts which will mean a lot less time spent inputting data from paper sheets in the future. Even more importantly for onlookers, however, is the fact that you can now go online and see how the counts are coming along - almost in real time! This facility will be available right through the season for Morning Flight, the Hawkwatch and the Avalon Seawatch, so do check out the site once we go live (very soon!) - it's the next best thing to being here! As well as being generously sponsored for another year by Swarovski Optik, this year the CMBO counts are assisted by product and computer programming from Specteo, a company that offers computer logistics in the field for collecting, storing and reviewing scientific data. 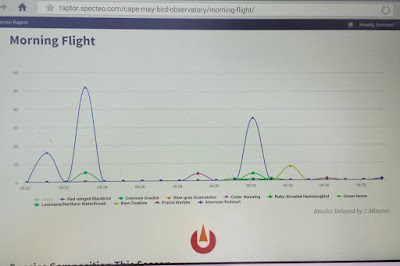 Small but select describes this morning's Morning Flight watchers. Higbee Dike is a remarkable place to be during fall, offering opportunities to watch not only the intriguing phenomenon of the morning flight itself, but also the comings and goings of a wide range of both land and waterbirds [photo by Mike Crewe]. Two screen shots of the new data presentation now available of the CMBO counts through Specteo. Data is updated every two minutes, so presentations are almost in real time - check back regularly to see how the season develops for our three seasonal counts. Morning Flight started today, the Hawkwatch starts September 1st and the Avalon Seawatch starts September 22nd. Though day one of the 2015 Morning Flight was relatively quiet, there were some stalwarts to keep us interested. Indigo Buntings are present throughout much of the count period and seem to have a very protracted migration. At the start of the season, blue males can still be seen, but these will later be replaced by drab brown juveniles [photo by Mike Crewe]. You might be surprised to learn that even common 'resident' species such as Northern Mockingbird pass through and head south in the fall. But even these species take part in seasonal movements to a greater or lesser degree and many early birds on the move will be juveniles that are not so much migrating as dispersing away from natal areas. Note the dark flecking on the body of this bird which marks it out as a juvenile - a party of seven passed the dike at one point this morning [photo by Mike Crewe]. This is Cape May, so don't forget there's plenty of options for birding in other areas beside Higbee Dike. This adult Sandwich Tern and its fledged youngster were at Cape May Point State Park briefly this morning before beach traffic pushed them off. Hopefully they may stay in the area for a few days. At this time of year 'pairs' of terns on the beaches typically consist of an adult and a youngster rather than two adults [photo by Mike Crewe]. After a relatively wet first half to the year, these past few weeks have been stiflingly hot and dry, which is really not good for the environment. Cape May has a water shortage approaching crisis level, and yet local townships allow those that so choose to throw water on their manicured lawns as though it were an infinite commodity. Thankfully, some of us are gardening for wildlife and thinking about future generations and, though our own property is looking a little sorry for itself we have not, yet, once had the hose pipe out this year. While there is plenty of good birding to be had right now - terns on the beaches were perfect for our terns workshop yesterday and shorebirds are lining up for our suite of shorebird workshops coming up (check out our online calendar for details of these and other workshops) - it will continue to get better and better as the season progresses. Recently, a small band of us got together and did the annual tidy-up at Higbee Beach, in preparation for the start of our fall research season. August 16th will see Glen Davis climb the dike around dawn and check off the first flight call of a northbound migrant that will mark the official start to the season. Of course, migrant songbirds are already coming through even now and Yellow Warblers, Black-and-white Warblers, American Redstarts, Indigo Buntings and both Northern and Louisiana Waterthrushes have been noticeable lately. That's the preparation dealt with, so what of the unexpected in the title? As ever, nature is producing its surprises for us and intrigue this season has started with a phenomenal and probably unprecedented northward movement of White Ibises. While small numbers of White Ibis are almost to be expected at the end of the breeding season, as birds spread out from southerly breeding grounds, numbers in recent years have been showing a steady increase. Single-figure counts are now expected, and even gatherings of up to 100 birds have been known to occur at least as far north as Delaware. But the estimate of 1,700 White Ibises reported from Chincoteague, Virginia on the Delmarva Peninsula caught everyone by surprise! While numbers in Cape May have so far been very modest in comparison, it's worth keeping an eye out for these birds at wetlands along our coast. The stage is set, the ground is prepared, our seasonal staff will be here to greet you. Come on down to Cape May, the good times are already starting! Perfectly-timed for our tern workshop, this juvenile Gull-billed Tern put on a great display for us as it snapped up dragonflies over the plover ponds. Gull-bills as young as this are not a regular sight in Cape May, so it was nice to get to grips with this distinctive bird, with its dove-gray wings, brown-speckled upperparts and distinct orangey tint to legs and bill [photo by Mike Crewe]. It's worth being out and about at wetlands during August to witness returning adult shorebirds. Such birds are generally darker and show more patchy plumage than the dapper juveniles that will come later. On the Lesser Yellowlegs and Stilt Sandpiper above, note the mix of black-centered, Alternate (breeding) plumage scapular and mantle feathers, and the pale gray, white-edged feathers of the incoming basic (non-breeding) plumage [photo by Mike Crewe]. A White Ibis ponders the lack of white in its plumage... [photo by Mike Crewe]. Expecting the unexpected doesn't always throw up pleasant surprises. Though Black Swans are unarguably graceful birds, the place for them is in Australia, not on Bunker Pond, adding to the eutrophication of the water already being caused by record-high (and still growing) numbers of non-native Mute Swans and introduced Canada Geese there. Our migratory birds desperately need good, well-managed habitat to rest and feed up in before continuing on their arduous journeys - providing such habitat at critical stop-over sites like Cape May seems to be the very least we can do for them [photo by Mike Crewe]. 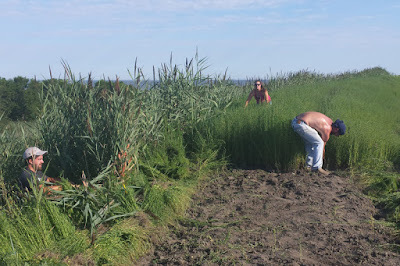 Getting prepared - our brave die-hards risk life and limb tackling invasive aliens to ensure that Higbee Beach is ready and waiting for the birds that will surely be arriving soon. Preparing the ground will ensure we can continue with long-term migration studies using thorough protocols that will provide us with the right answers when questions about the environment need to be asked [Photo by Mike Crewe].